Home USA Politics Obama Flint Water Stunt Wasn’t A Stunt? Obama Flint Water Stunt Wasn’t A Stunt? WASHINGTON – (Newsblaze) – “The man was just thirsty,” that was the refrain that White House Spokesman Josh Earnest used in responding to a series of questions from CNN’s Michelle Kosinski on Thursday. She was asking about a photo op on President Obama’s trip to Flint, Michigan the day before The photo op included the President drinking Flint’s water three times in what the White House said was to relieve a coughing spell. “So I guess what I would say is this. I would acknowledge that the President was indulging the photographers in which he consumed water from Flint after the briefing with federal officials. But at the speech, the man was just thirsty.” Earnest noted. 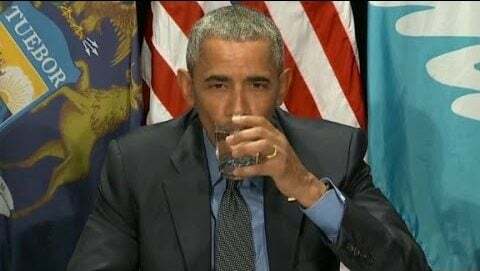 The President’s possibly abnormally placed consumption of water came after a 20-25 minute speaking engagement and was observed during a session with White House Press Corps photographers afterwards. “I think he was coughing from having spoken for 20 or 25 minutes in a row without having anything to drink.” noted the White House Spokesperson. “And then he did it two more times. And he called it a stunt, and said it wasn’t a stunt, and then he – calling for the water, and saying, I’m thirsty, and where’s the water?” the CNN White House Correspondent asked. “There typically is a glass of water or tea underneath his podium when he’s delivering a speech. It was not there yesterday when he was giving the speech. And I think everybody, again, who was listening carefully noticed that 20 or 30 minutes into his remarks he started coughing and asked for something to drink.” Earnest responded.